Your cluttered PC can be transformed into a clean, crisp computer with wonderful airflow. There's no doubt about it: Taking the time to tidy up your cables is something every system builder and upgrader should do. Aside from the small additional effort it takes, there are no downsides whatsoever—but benefits abound. Even if you're not into the clean aesthetic, a PC with its cables properly routed and secured will run cooler and quieter, accumulate dust more slowly, and be easier to upgrade in the future. Here's how to transform that terrifying tangle of cables into a prim, polished PC. There is no secret to proper PC cable management. There are, however, a number of strategies to ensure a good outcome. It starts with wire ties, a keen eye, and a bit of patience, but the right components and component placement also matter greatly. A little forethought can make a big difference to your case's cable clutter. Many cases, particularly higher-end models designed for enthusiasts, have numerous features designed to make internal cable management easier, including rubberized routing holes in the motherboard tray. Many of today’s case manufacturers take cable management very seriously and have designed their products to tame tangles. They scatter strategically placed holes about the motherboard tray, leave adequate space behind the motherboard tray to hide and tuck cables away, and litter the case with tie-down spots. When building a new system, we’d highly recommend buying such a case. 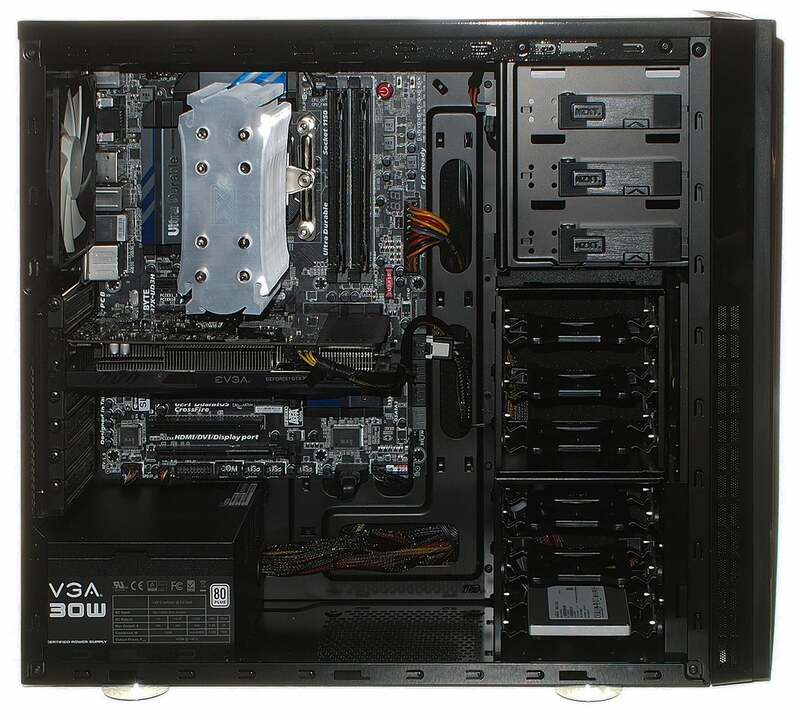 It might cost a little more than a generic chassis, but it's worth the investment and could last though multiple upgrade cycles. A modular power supply unit (PSU) is also a good idea. 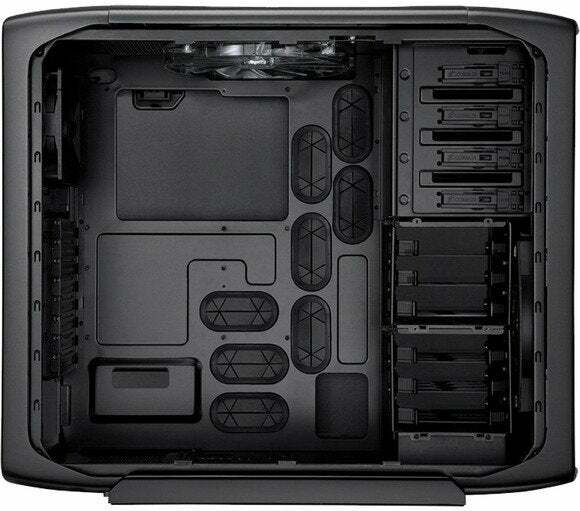 It sports detachable cables, so you only have the cables you're actively using taking up room inside your case. Modular PSUs have their detractors, because technically speaking every connection or break in a wire increases its resistance. In the many years I've been building systems, however, I've never had a problem. Being able to use only the cables you need is great and eliminates the need to stash large, unused bundles of cable inside your case. Modular PSUs are not a necessity—in fact, the system featured at the end of this article doesn’t use one—but they will alleviate cable clutter. The raw components may look like a mess, but turning them into a neat, clean build doesn't take much extra time at all. Component placement within a system is also important. Of course, your motherboard and power supply are only going to fit in one spot, but drives, graphics cards, and other expansion cards should be positioned in such a way that their cables—or the components themselves, for that matter—don’t interfere with one another. You should also try to position them so that component cables begin near one of those holes in the motherboard tray if at all possible. When assembling a system I find it’s best to save the drives and power supply for last. When all of the other components are in place, it’s easier to see where to position the drive (or drives) and where to route cables. The process of actually cleaning up the cables within a system is going to vary from build to build, obviously. The best advice we can give is to give each cable some attention and route each one as neatly as possible. It's best to snake the cables behind the motherboard tray and to not tie anything down until every cable has been connected and is roughly in the ideal position. I like to route and connect any front-panel or case-related cables first. Then I install any data cables for various drives, and finally place in the power supply. If you throw everything into the system willy-nilly and connect it all up, you’ll often find yourself disconnecting or moving things around to get the cabling right. 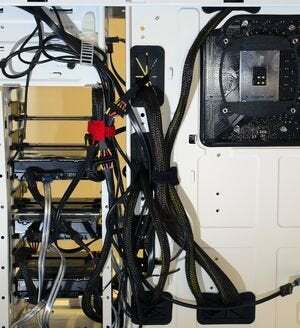 Keep airflow in mind; don't cover any case fans or coolers with a cable if at all possible. The vast majority of the cabling should wind up behind the motherboard tray in many builds. If your case doesn't have cut-outs in the motherboard tray, try running all your cables along the side edge of the tray to achieve a clean look. Once you’ve placed all of the cables, start securing them in tight bundles, starting from the top of the case and working your way down. If any cables are especially long or have excess connections, consider tying the cable together to prevent it from getting in the way of other components and cords. 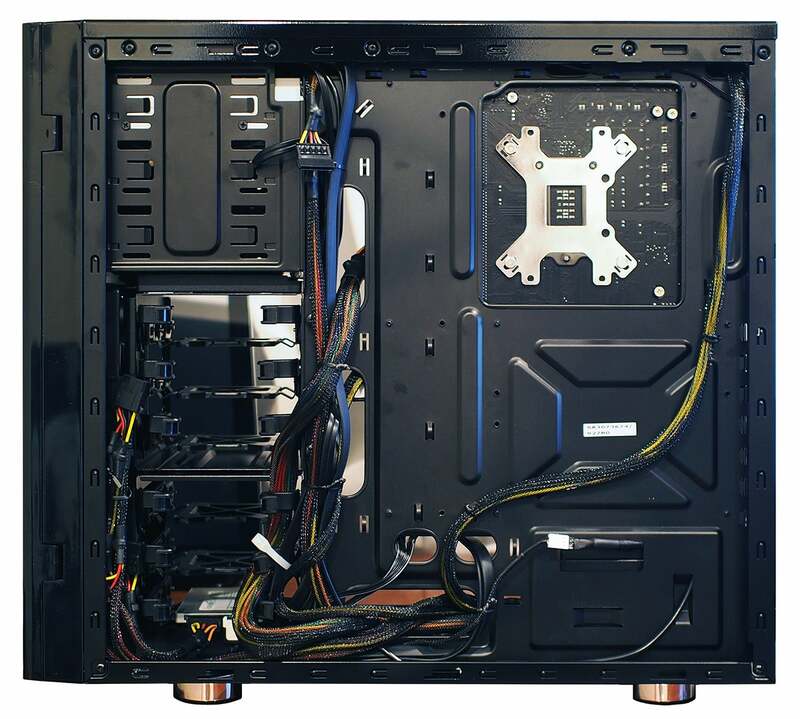 In most cases, you’ll find a large space—relatively speaking—toward the bottom of a system where the bulk of the excess cables can be hidden and secured, as well as ample room behind the motherboard tray. 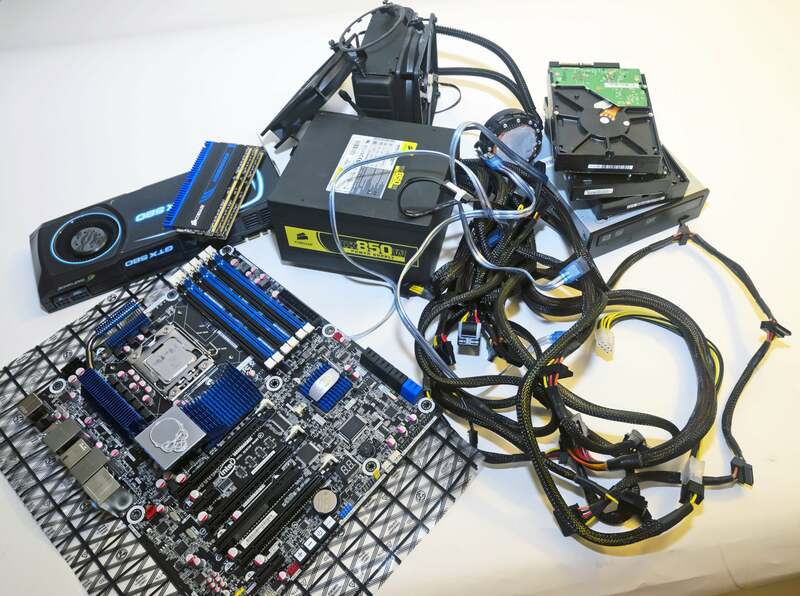 A behind-the-motherboard glimpse at a cleanly cabled system. Velcro strips and twist ties are ideally suited to PC cable management, and adhesive tie downs can also come in handy if your case doesn’t already have tie down locations built-in. Heck, you can even use rubber bands! Don't use zip ties if you can avoid it, however—if you ever need to remove a component or rewire your PC, zip ties have to be cut away, and it's all too easy to slice a cable in the process. Stick to reusable, removable ties if at all possible. Few cables can be seem from the front side of the same system. Success! 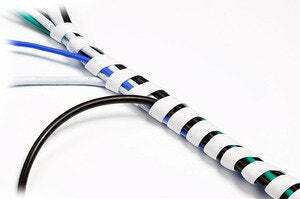 Now that you understand the building blocks of smart cable management, you may want to see smart cabling in action. 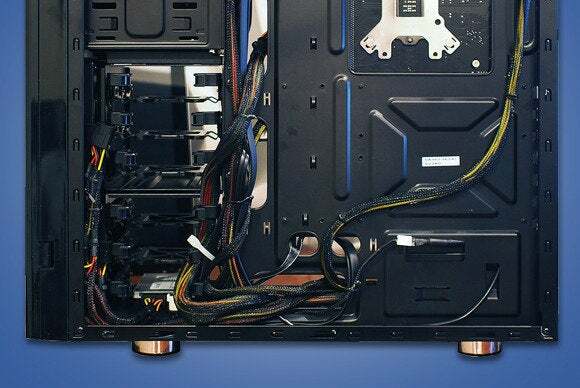 Check out PCWorld's guide to organizing your PC cables for a complete system build that discusses proper cable management each step of the way. A spiral wire wrap in action. If you’re looking to tidy up the cables on the outside of your PC as well, all of the same suggestions apply. Disconnect all of the cables and reconnect them thinnest to fattest, giving each cable some individual attention. Connect any thin audio cables first, then move on to the USB cables, Ethernet cables, and power cables. Route each cable neatly, making sure not to create any tangles along the way, and then use Velcro strips to create tight bundles. Spiral wire wraps can also be great for tidying up the cables outside your PC. Good cable management isn’t going to improve your benchmark scores or give your system a magical performance boost, but it will make the system run cooler and quieter and could enhance its longevity too. Give it a go—especially if you’ve got a system with a side panel window and want to show off both your computer's components and your crisp, clean cabling skills.